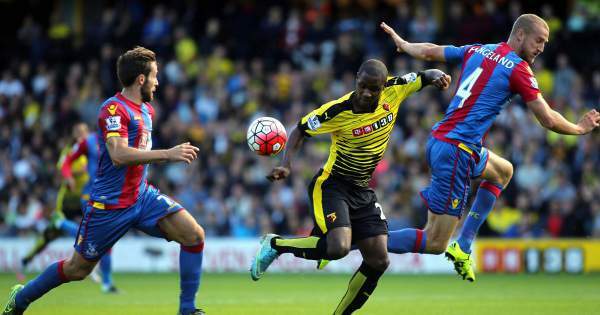 Crystal Palace vs Watford Live Streaming EPL Score WAT v CRY: Crystal P takes on Watford at the Selhurst Park for their game on the 29th match day of the Premier League. CrystalPalace is currently 17th on the table with 25 points from 27 matches, two points below Swansea City and one point above Hull City who are in the relegation zone. On the other hand, we have Watford who are currently 13th on the table with 31 points from 27 games, below on goal difference from Burnley and one point above Bournemouth. 18th March 2017 at 20:30 (IST). C Palace needs to take a move on as they are just one point above the relegation zone and any slipups could be very costly for them as there are only nine more match days left in the league. They have won just seven games out of the 27 they have played. They have just won two games in a row which have helped them to get out of the relegation zone, but they are still just one point safe. Scott Dann was available for the game against West Bromwich, but Sam Allardyce has settled on a three-man defense without the skipper. Both teams have played 114 times together in all competitions and in that CP have won 47 times, Watford have won 41 times and 26 times have been draws. Both Argentinians Mauro Zarate and Roberto Pereyra remain out for the season due to a knee injury for the Hornets. Watford has suffered 43 league defeats against Crystal Palace, only against QPR they have lost more in the league, 48 times. Troy Deeney would be a very valuable player in the fixture as he has scored 4 times in his last three appearances against CPalace. They have won two games, drew one and lost three in their last five games in the league, losing to Southampton by 3-4 in their previous match of the league at home. Gomes, Prodl, Kaboul, Cathcart, Amrabat, Capoue, Holebas, Behrami, Ighalo, Deeney, Okaka. Hennessey, Sakho, Aanholt, Tomkins, Joel, Zaha, Puncheon, Townsend, Luka, Benteke. CrystalPalace is in good form as they have won their previous two games and will try to win here as well.